Since the last Devblog we have fixing a lot of leftover problems inherited from “The Big Switch” (see Devblog 008). Luckily, by its very nature, that process of “fixing” soon evolves into a process of refinement. Hal has spent a lot of time with the landscape, adding to its detail at a geological level, preparing it for a new layer of flora and fauna and subsequently, what we are most excited about – a layer of civil frog engineering. Also having the time to refine the landscape has made it possible to reduce the impact on the CPU . ( i.e. making it run better ) We’re excited about this as, oddly, even though the landscape looks more detailed it seem to run more efficiently than before. We will most likely dedicate a whole devblog to this at some point. On the one hand I want to get a beta out as soon as possible for online frog activity, but i don’t want to just release the bare minimum. I have been getting a lot of questions about what shape the beta is going to take. It is an evolving process, like Amazing Frog? always has been. But, in terms of how the Beta will be delivered, we do not want players to lose the content from f0.2.8, so its likely that we will create a split build. This will mean that you can have both versions until the new one is ready to fully replace the Unity 4 build. We want to be sure that the new version is working ok before we remove the current version. Also this gives us some small opportunities to fix any outstanding bugs in f0.2.8c. The features available for online will grow as we add updates. For example, right now I have no plans to set up a bunch of dedicated servers, its too soon to think like that. We just want to empower players to play online with each other and to give you as much control as possible on how to set up your online game. This week I have been looking at how to provide frogs with these controls. It will be done through the fPhone. The fPhone will need an upgrade in terms of controls and components, but it should give you the ability to play Amazing Frog? for a bit and then at any point decide to open your game to other players or jump into someone elses. A Social fApp, essentially… I am sure you can have a guess at what we are going to call it. Growing the companies that exist in SwindonShire is something very high on our agenda. We will be making specific game types and modes in time, but thats the format we are heading for initially. As I said though, this is an evolving process. Stuff we are thinking about. First off – thanks. Planes- yes. We can’t say when it will happen and it is typical of us to make a spaceship before a biplane, but we have a list or crafts that we are working on. Will a debug menu or something similar to Skate 3s menu where you spawn items in such as containers, ramps and cars ever be added? Usually something like this exists in a game because its something that the developers use while building the game. This is not something we have been using yet. Hal and I have often discussed how we could use more in game tools to help us to test things. We do have plans around this purely to help us develop, if it will turn into a feature i do not know yet. The movie camera is an example of an object that is derived from us wanting to do something for ourselves, we wanted to make screenshots and movie clips (not that we have got around to updating the store page). Besides, after the movie camera it was clear to us that we needed something more GoPro ish to get some trailer footage. Spawning stuff is not out of the question… we do have a major frog item that is as important as the fPhone in the works which I will talk about when unity 5 version is more stable. How fleshed out will the frogluminati be? When will story come into play? And also specifics on the UI and capacity of online and if there will be any other features that will be online other than multiplayer? Firstly Pooti, what’s the frog illuminati? Online, currently we are all about making it work, it’s not easy. A bit like I was saying earlier, we want to add features like survival modes and team stuff, sharing data, but we also don’t know how this is going to evolve. Where will the garage where you park your modded cars be located in the map? Also, will it have a parts shop included in it or is it going to be separate from the garage? So the area outside the hideout was always intended to be your “driveway” however we may have to build an extension, for reasons that may become clearer in the future. As for a parts shop, yes. 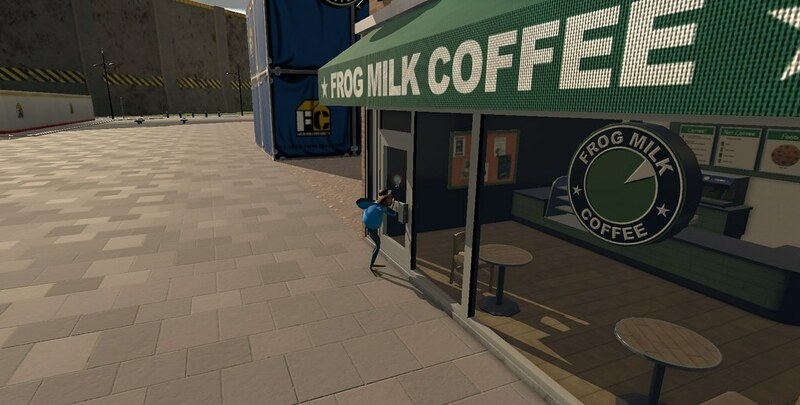 The frog Milk Coffee Co. Shop was created to test out the whole shop thing and we intend to flesh out the entire high street with shops. Each shop can take us a few weeks and I will announce when we have entered our shop creation frenzy… It’s not yet as we are focused on “the big switch” and online. 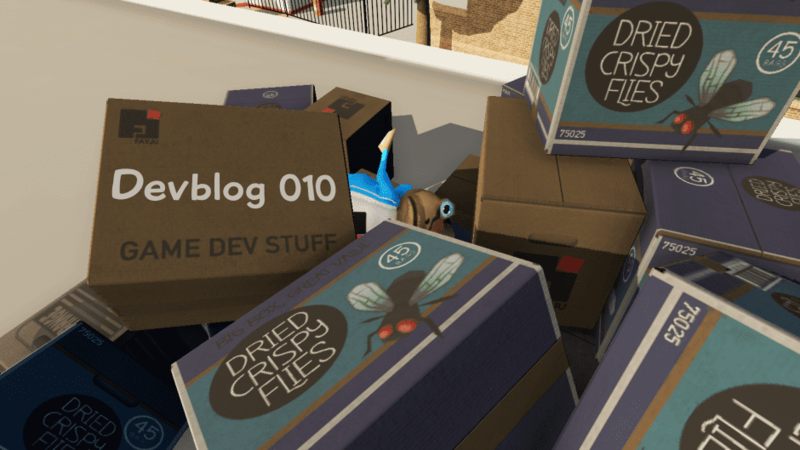 Also modding the cars – as esteban_da_good asked about the Tiny Poopers, yes all vehicles will follow… But it takes a lot of Hal’s time to make all the custom parts so it will start with just the folvo, frog all other vehicles to follow. I actually have a question as I am a bit of a football fan. Will the Swindon Town Stadium be added at some point? I think it would be interesting. Hmmm… We need a stadium, eventually. Where else could the ceremony of Claw-Plach happen? But as to its purpose, I’m not sure how grounded in the reality of Swindon a stadium would be. It is not as high on our list as many other architectural necessities, like a network of roads, for example and maybe more roundabouts. Can you guys add it so the police have guns to make them more threatening. And so that they also have a police helicopter please and thank you. Thankfully in the UK the police don’t carry guns that often…. But in Amazing Frog? 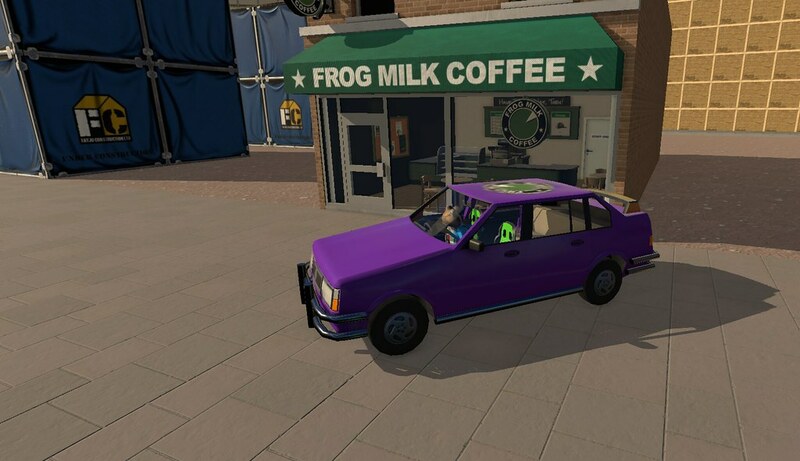 For me, your question is asking -will we see an update to the FrogLife™ system that allows frogs (including police) to carry guns. Yes. However as we move through all the components of Amazing Frog? Not just making them work in Unity 5, but also online ready, FrogLife™ is one I will not be able to upgrade until the later stages of this process. Thanks for all the questions, it really helps explain the process, keep adding to the thread and I will try and answer all in due course. Also I need to condense the suggestions down to something manageable too to put into a post. Also thanks to you all in the community who help out, it doesn’t go unnoticed.